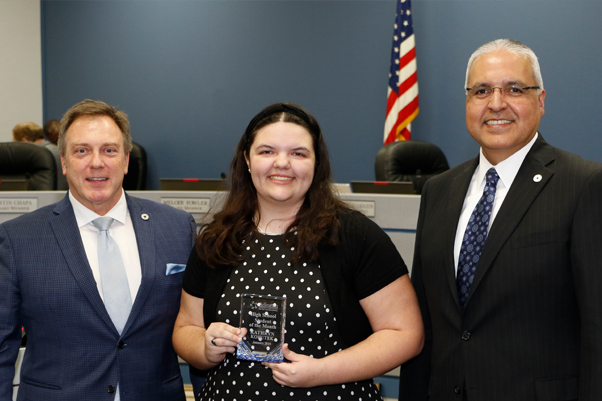 Congratulations January 2019 High School Student of the Month Kathryn K. from Martin High School. Kathryn exemplifies the AISD cultural tenants for the district and school. Kathryn is a risk-taker, she takes ownership of her learning, she responds positively to differences, she makes every interaction count, she puts others first and gets, and she gets better every day. Kathryn is a top student, ranked No. 21 out of a class of 784 students at Martin. She is in National Honor Society, Spanish Honor Society, Science Honor Society and Math Honor Society. Kathryn is also the features editor of The Warrior Post, the president of the Martin Book Club, the president of the Spanish Honor Society and a member of the Academic Decathlon. Last year she was recognized as an AP Scholar with Distinction by the College Board after scoring 3 or higher on 11 AP tests. Kathryn believes that it is important to lead by example, and that is what she strives to do in all areas of her life. She hopes to become a mechanical engineer, and her career goal would be to be a Disney imagineer. Congratulations, Kathryn!